Brad Keselowski, driver of the #2 Miller Lite Dodge, tweeted during a fire delay at the 2012 Daytona 500, becoming the first driver in the history of NASCAR to tweet during a race. The 2012 Daytona 500 was the first race in Daytona history to be delayed for a day. It was also the first to ever air on primetime television. But in a strange turn of events, driver Brad Keselowski ended up with the most memorable first of all -- tweeting from the scene of his car crash. After Juan Pablo Montoya's car struck a safety truck holding 200 gallons of kerosene, a fire delay with 40 laps remaining went into effect. During the break, Brad Keselowski driver of the #2 Miller Lite Dodge, tweeted a photo of the fire from his car. Fans were quick to ask if he was driving while using the social media service. He replied quickly, saying he was indeed stopped. He then answered several tweets, ranging from how much battery life was left on his phone (28 percent) and his thoughts on track conditions. He also retweeted incoming news about the race. 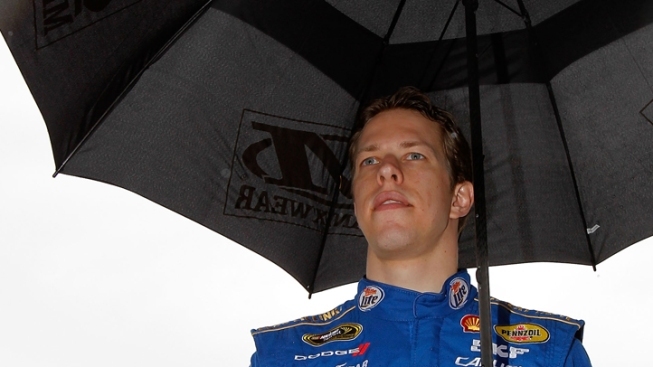 Keselowski's initial foray into digital journalism didn't get him into victory lane though -- he finished 32nd overall. He said he keeps his phone in his pocket during races and told a fan on Twitter Tuesday that he'd continue to tweet during races if NASCAR allowed him. His tweets during the race helped him gain more than 150,000 new followers in just a few hours. By comparison, the winner of the race, Matt Kenseth, has only 71,127. Several states in the country have laws prohibiting drivers from texting while driving, even while stopped.